Before Ant-Man entered the MCU, I really had no idea who he was. The first Ant-Man movie was awesome, but Ant-Man and The Wasp somehow managed to be even better. Now he’s in my top three…wait…Thor, Spidey, Iron Man…uh…Cap…well, my top five anyway. 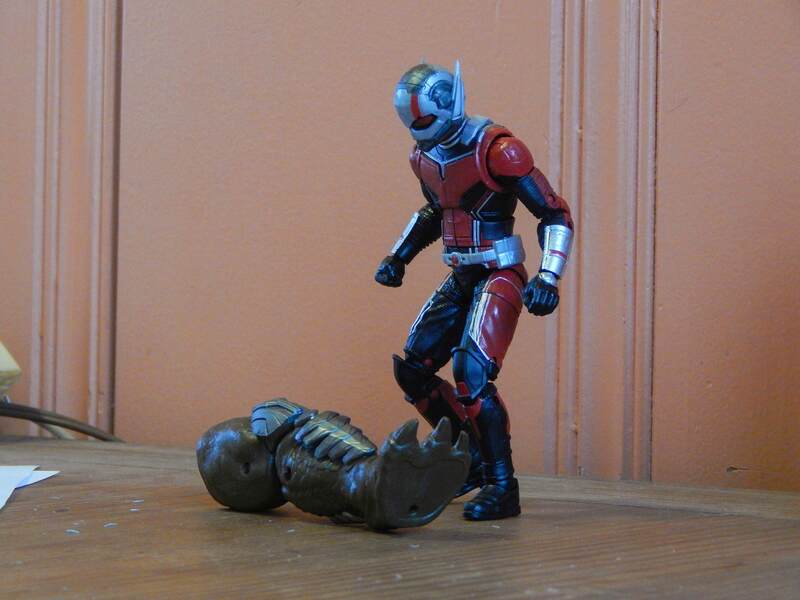 Today we’re going to be taking a look at the Marvel Legends Cull Obsidian Wave Ant-Man and The Wasp Ant-Man. Couldn’t you make that name a little shorter Hasbro? We could start off by looking at the box, but once you’ve seen one Marvel Legends box, you’ve seen ’em all. Plus, who really cares? It’s a box. End of story. Inside the box is what we’re all really interested in: the Ant-Man figure, his interchangeable head and the giant scaly green leg. Well, maybe not the leg. There’s really no point in taking a closer look at the leg, unless you plan on buying the entire wave, in which case you’ve probably already made up your mind and need no review to convince you to complete your purchase. So let’s set that piece aside and get to the most exciting bit: the Scott Lang head! Marvel Legends is usually not great at capturing the likenesses of actors. I say usually because they slammed the bullseye dead center with this head. It’s a perfect tiny version of Paul Rudd’s face (well, as perfect as you can get without paying $200+). The cocky expression is great, the molding is excellent and the paint/print is spot on. 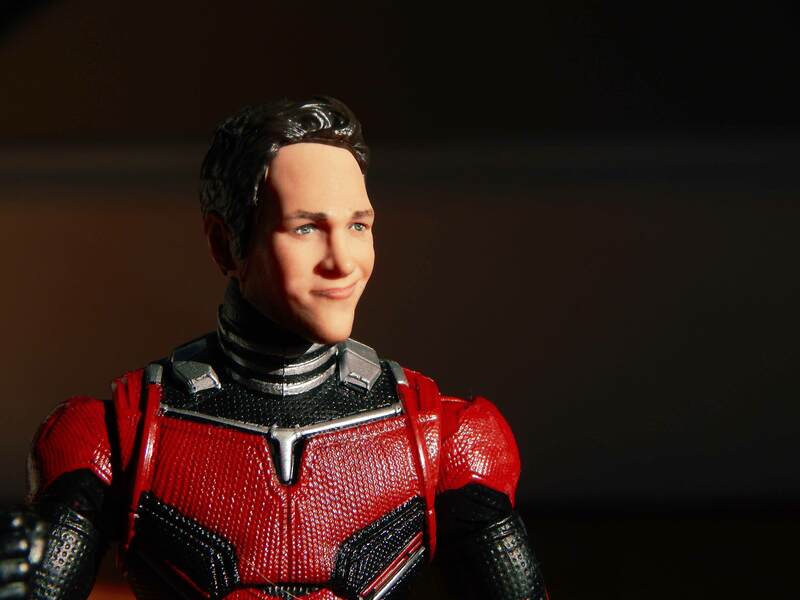 It’s kinda scary to look over at your action figures and see a severed Paul Rudd head smirking back at you. There’s a lot of hilarious photo possibilities with this head. 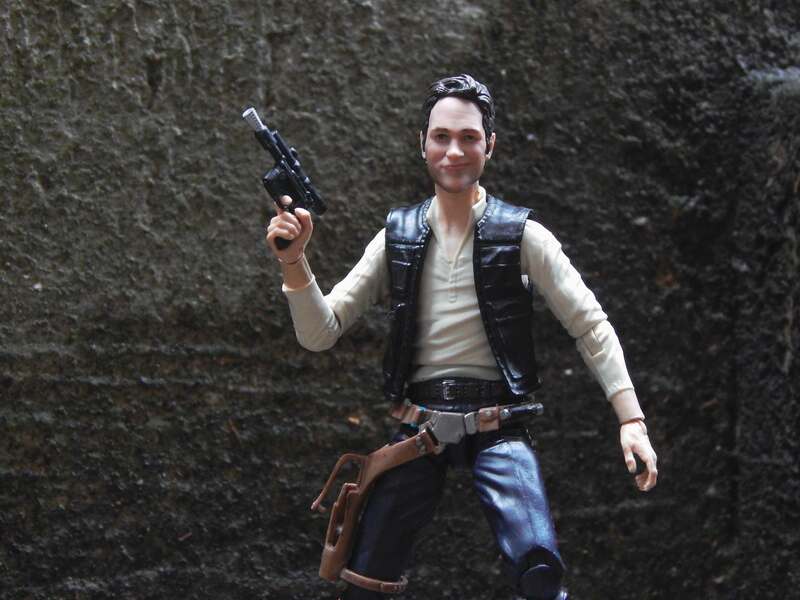 Ever wanted to see Paul Rudd as Han Solo? Well, now you can. The head attaches via a ball peg, so it’s easy to put on and remove. The figure itself is one of the nicest looking Marvel Legends figures I’ve ever seen. There’s so much detail! The whole suit has a bumpy cloth-esque texture, as well as some molded wrinkles here and there. And the amount of paint! So much paint! Of course, having a lot of paint doesn’t mean anything if it’s crap, but Hasbro did a great job. Both the front and the back of the figure is loaded with painted detail with little to no flaws. The Ant-Man helmet is molded in three or more different colors with a bunch of paint to boot. Unlike Wasp, there are no eyes visible, but I’m fine with that. 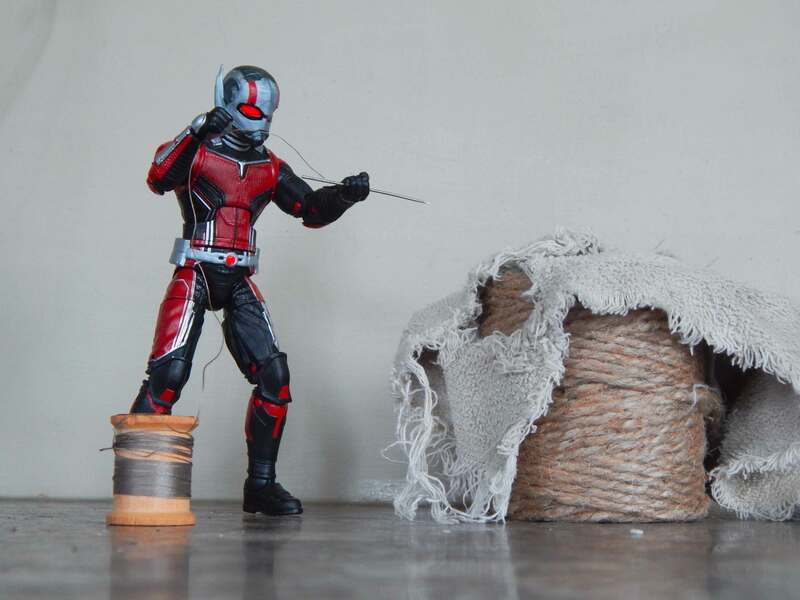 This Ant-Man figure isn’t all butterflies and rainbows though. There are a few issues, but in the detail department, this guy hits home. Before I get into articulation, let’s go over the issues I mentioned. First and biggest issue: soft plastic. The antennae on the helmet and the plastic of the joints are very soft. My figure came out of the box with a severely warped right arm (from the front) and a bent antennae. It took quite a bit of work to get the arm straightened out and I still haven’t gotten the antennae to stay straight. The second issue I have is with the joints. Some of them are ridiculously stiff and some of them are almost too loose. The shoulder is a good example. The outward hinge is very stiff and difficult to move, while the swivel is fairly loose. 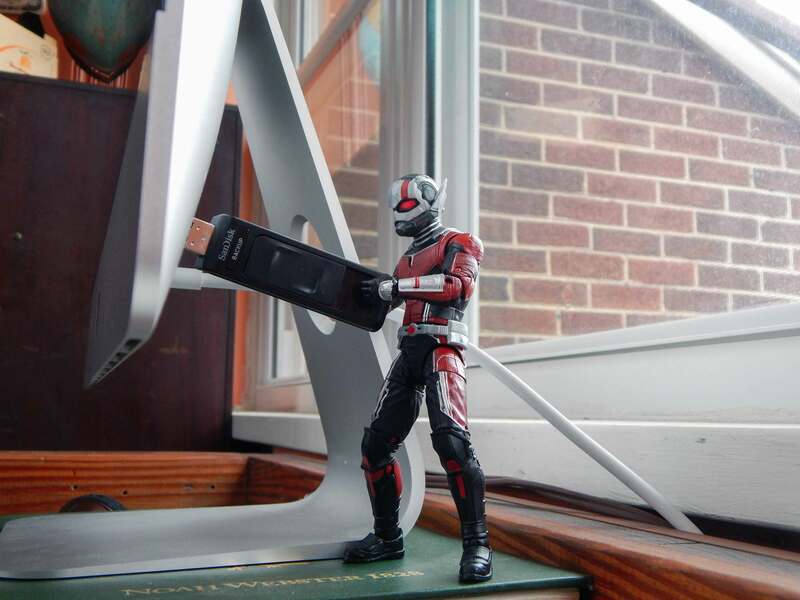 It’s hard to pose Ant-Man holding anything on the heavier side. A few other joints have loose spots as well and the neck joint is so difficult to move it’s easy to mistake it for not having any range of movement at all. Final issue: no extra hands. I mean, it’s not a big problem but it would have been nice to get at least one extra set of hands. Actually, I’m not sure if his hands even come out and I’m probably not going to try to find out. None of these problems are deal breakers. Just be aware of them. Now, articulation- wise, there’s nothing out of the ordinary. If your familiar with the Legends line, the only spot that might get you surprised is the torso joint. It has a fairly restricted range of motion. But this is Ant-Man, not Spider-Man, so the restricted joint isn’t really a problem. 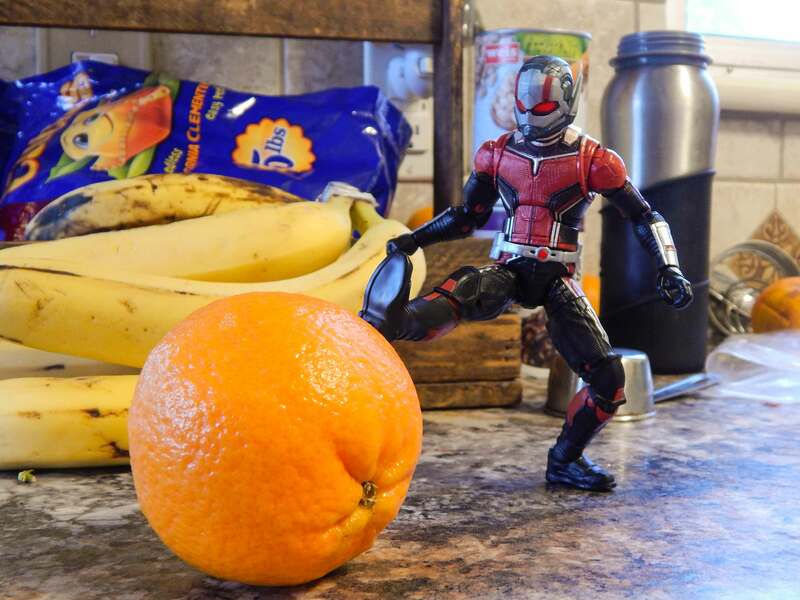 You can get Ant-Man into plenty of useful poses, though I was surprised at how difficult he is to balance. So now we get to the twenty-dollar question: is he worth buying? In short, yes, especially since he seems to be easy to find at a lower price than $20. I found mine on Amazon for $10. I definitely recommend him. Yeah, he isn’t a top-of-the-line figure, but for those who can’t afford the Figuarts or Hot Toys version, this guy is perfect. He looks good, he poses fairly well and he’s fun and easy to shoot. You can find him on Amazon or at Big Bad Toy Store. 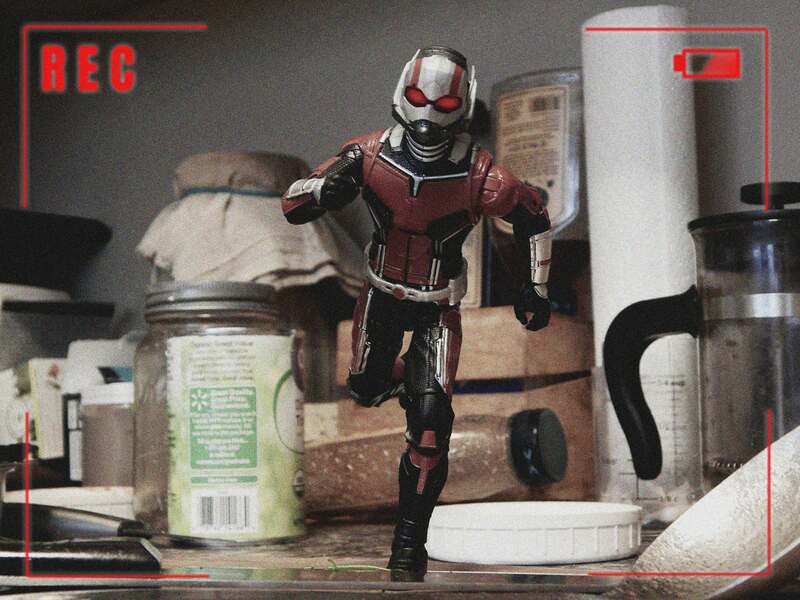 Zee, I very much enjoy these photos … and thanks for the review, I was considering getting this figure (to join in on the Ant-Man fun), and now I have a pretty good idea what to expect. As a matter of fact, the build, articulation and quality of this figure seem to be quite sinmilar to the Catwoman I have and love to photograph, so: Not a bad choice for the price, it appears. Thanks! I’m glad my review could help! Hmmm – maybe it’s time to branch out from my Lego figures. Thanks for the review! I happened to order this exact model off Amazon just before your review came out. Now that I have it in hand I must say your review is spot on. For a Legends figure it is well sculpted, but the joints are super stuff. Over all tho, for a $10-$20 figure, its really good. I’m sold on it thanks to your review Zee. I can see me including it in jANTMANuary 2020. Thanks.